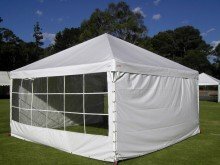 Spuds Marquee Hire supplies a large selection of marquees for all types of private events, from lunches, birthday parties to christenings and wedding receptions, both small and large. 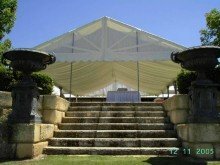 Our range includes A-Frame and Structured Marquees in a variety of lengths and widths to suit all occasions. 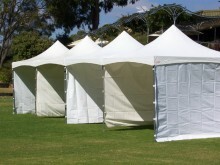 These marquees are weatherproof against rain and wind, and can be set up on most surfaces. The marquee can be designed to create any look, which makes them ideal for themed parties and events. At Spuds, we provide a range of lighting options, including fairy lights, rice lanterns and chandeliers that can be installed in our marquees . We can also arrange heating, air cooler, chairs, tables, and any other finishing touches you’d like to add for your special occasion. Contact one of our friendly staff to find out more.